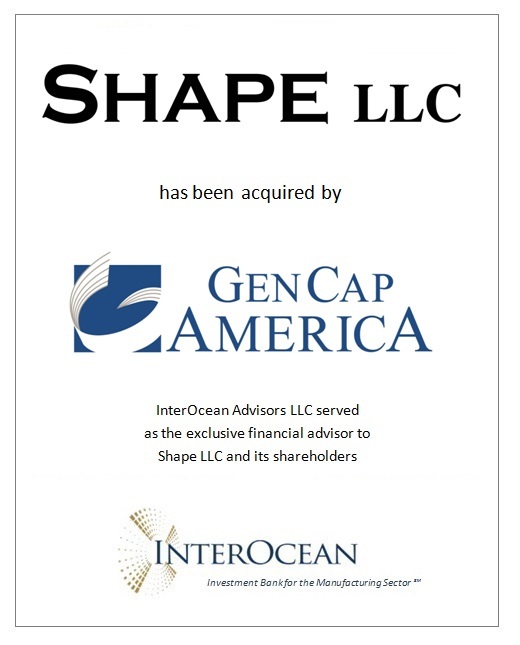 InterOcean Advisors LLC is pleased to announce the successful sale of Shape LLC (“Shape” or the “Company”), a leading designer and manufacturer of custom magnetic products, to Gen Cap America, Inc. (“GCA”). InterOcean served as the exclusive financial advisor to Shape. Shape is a global manufacturer of optimally designed-for-performance electrical transformers. The Company’s magnetic transformers are used to regulate output current to ensure constant power to mercury vapor and metal-halide lamps. Shape specializes in the production of large transformers with rated wattage above 250 watts. Applications for the Company’s products include airport lighting, shipboard ballast water treatment, ink curing, municipal water treatment, emergency vehicle equipment power, protection of electronics and re-purposing fracking fluids. Originally founded in 1966, Shape LLC is a manufacturer of specialized transformers used in airport lighting, airport security systems, ultraviolet curing, water sanitation, telecom equipment and other niche applications. Products are sold directly to original equipment manufacturer customers. The Company’s headquarters and manufacturing facility is located in Addison, Illinois. Gen Cap America, Inc. is a private investment firm headquartered in Nashville, Tennessee. GCA specializes in acquisitions and recapitalizations of middle market businesses. The firm targets established businesses with demonstrated operating histories and quality management teams with revenues between $5 and $100 million. GCA partners with management teams who wish to invest in their companies by becoming part of the buying group. Gen Cap America, Inc. was founded in 1985.